This inexpensive device was developed by Steve Hines to allow blind people to play 8-1/3 RPM talking books available from the Library of Congress and the American Printing House for the Blind, which play at half the slowest speed of conventional record players. The American Printing House for the Blind sells a custom 8-1/3 RPM record player. This adapter is based on the principle of a car tire. When a car is driven, the bottom of the tire is in contact with the stationary road, and therefore traveling at 0 MPH. The axle travels at the same speed as the car at 60 MPH. The top of the tire travels at 120 MPH to catch up and go around again. The important principle is that there is a 2:1 relationship between the 60 MPH axel and the 120 MPH top of the tire. This record-player adapter is thin and drops onto the turntable like a record. The top and bottom discs are attached to each other at the central hub, and are free to rotate on the turntable stem, although rotation of the middle layer with protruding arm (shown in black in the drawing below) is stopped when it reaches the support for the record-player stylus arm. Three small rubber wheels support the device on the record player turntable. The bottom of the rubber wheels turn at the same surface speed as the 16-2/3 RPM turntable. 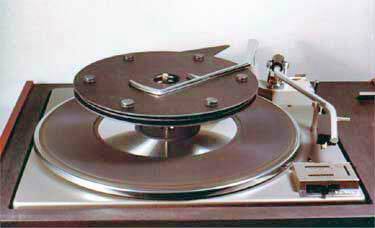 The non-rotating middle plate (with the protruding arm) is heavy enough to weigh down on the three rubber wheels to prevent the top of the wheels from skidding, with axles turning at half of the 16-2/3 RPM turntable speed to drive the record support at 8-1/3 RPM. When the American Printing House for the Blind was contacted about their licensing this adapter, they turned it down on the basis that they would not be able to sell their more expensive record players to the blind. They showed no concern for the benefit or cost saving to their members. This is not a product for sale. Do not contact us to purchase this product. This project is shown only as an example of past projects. Steve Hines currently offers consulting in the area of industrial design, novel solutions to your problems as well as a variety of licensable technology.